SCVHistory.com GZ0301 | Castaic | Equestrian Event at Castaic Saddle Club Arena, 1970s. 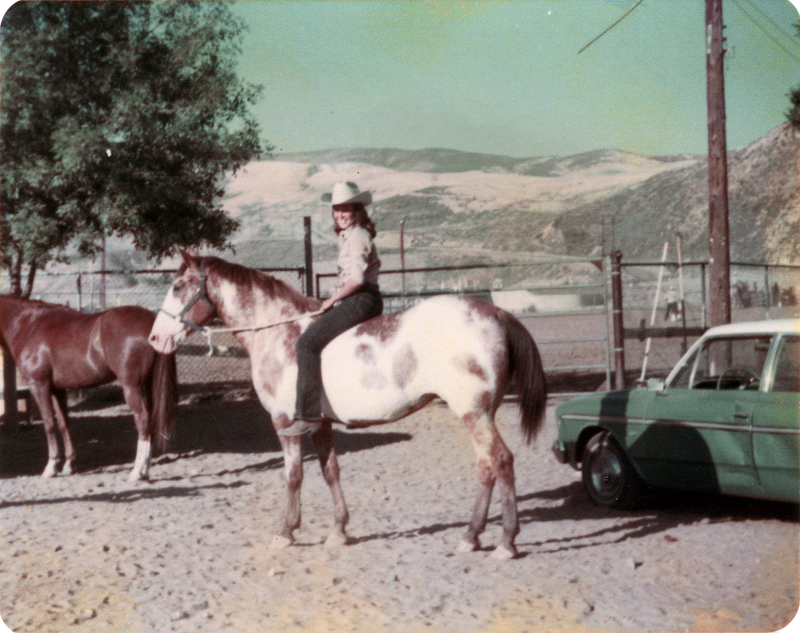 Contributor Michelle (Bordelon) Gonzales identifies this as her sister, Pam (Bordelon) Koopman, on her mare, Foxy, getting ready for a horse show at the Castaic Saddle Club Arena. The Bordelon girls boarded their horses at Jack Lilley's ranch in Honby. About the Castaic Saddle Club. As of 1957, the club roster listed 87 members. It held rodeos, horse shows and gymkhanas on alternating Sundays at an arena located off of Lake Hughes Road, on the flatland opposite (what became) the Castaic Reservoir's lower lagoon. The saddle club also organized Castaic Fourth of July parades and rodeos, and it funded an annual college scholarship for a graduating Hart High School senior who intended to study agriculture. The club went defunct after 1989 when it filed its last annual statement with the California Secretary of State. 1. California Secretary of State. 3. Membership and activities: News reports. 4. Location: Ben Kephart, pers. comm. 2017. Ben's father Clarence Kephart was a club officer in the 1970s. GZ0301: 9600 dpi jpeg from original photograph; online image only.